Get to know our fearless leader and Franchise Owner, Shannon Link! 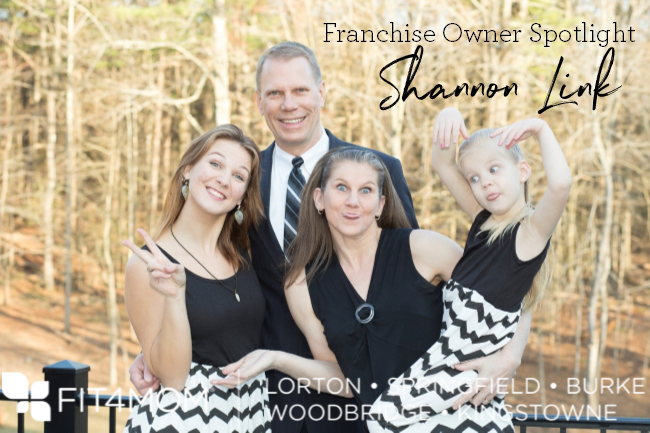 Shannon has been a franchise owner for over 4 years and continues to bring moms from all over NoVa together. She has created the village we all love! This month, we’ll put the spotlight on Shannon. When she isn’t doing all of the behind the scenes of running a business, you can find her teaching Body Back (and more!) throughout the week. I wish for every mom to have a place to just BE and to feel supported on this crazy ride called motherhood. Nearly six years ago Stroller Strides literally saved my life. The feeling of isolation and depression vanished – that is why I have to share my love of FIT4MOM to every mom crossing my path. Moms need to know that they are not ‘just’ a mom, they too need to be heard, valued and respected for all the change and hard work they do every day. Solidarity – it takes a village! What do you love most about being a franchise owner? What is your favorite song and exercise combo to sing at Stroller Strides? What is one thing being a business owner has taught you about yourself? What do you do for self-care and how do you find the time with your busy schedule? This might sound corny to most of you, but teaching classes are taking care of me as well. I get physical movement, I get inspired by all the wonderful women in my class, I get to connect with them, they make me feel good and make me smile – that is such a great feeling. I don’t see it as ‘work’ – it’s a form of self-care. On top of that I like to get pedicures (I mean – foot/leg massage in a massage chair! ), I go out to lunch BY MYSELF to give me time to reflect and just BE, I get in sporadic full body massages, I take nice long hot showers after everyone else is already asleep & I get together with friends to laugh and have fun. It isn’t easy to find the time – that’s for sure. I actually have to write it in my calendar as an appointment to ensure it gets done! What is one of your favorite FIT4MOM classes to teach? Stroller Strides hands down – I mean, who doesn’t love seeing the mamas interact with their babies while sweating AND singing?! However, I hardly teach it anymore due to timing AND I have an amazing team of mamas that are better at it than I am (I’m getting up there in age!) <3 so I suppose I’ll have to say Body Back ----- I get to see women transform right in front of my eyes, week after week – seeing the smiles and confidence grow is quite breathtaking. What is a fun fact that most of our moms wouldn’t know about you? What is one of your hopes for the franchise in 2019? My biggest hope is to get the word out to local hospitals, OB/GYN offices, women’s care centers, pediatricians and doctors about our programs. Moms need a village and we are just that – a village of mothers that have open arms to take in even more moms – the love we have is endless. I’d like to see every mom come to at least ONE CLASS so they can see that we are more than just a ‘workout’ – what we offer cannot be provided anywhere else. #AllTheMoms #Fit4MomLSBWKNoVa --- and I might want to open a few more locations … stay tuned! 2019 is going to be AWESOME!!!! !